Takeout delivery robots have begun transporting food to customers across Washington, D.C. this week. The Irish News reports US company Postmates has begun the rollout of the first fully automated robotic food delivery service in Washington, D.C. with plans to launch it across Europe in the future. The delivery robots, which are manufactured by Estonian company Starship Technologies, are designed to bring food directly from restaurants to customers doors. Using an Uber-style app, customers order a meal from a local restaurant, and the robot then navigates it’s way to the restaurant where it picks up the food and begins its journey to deliver it directly to the customer’s door. The robot uses built-in sensors and cameras to navigate it’s way across the city, reading traffic signals and road signs to avoid traffic. 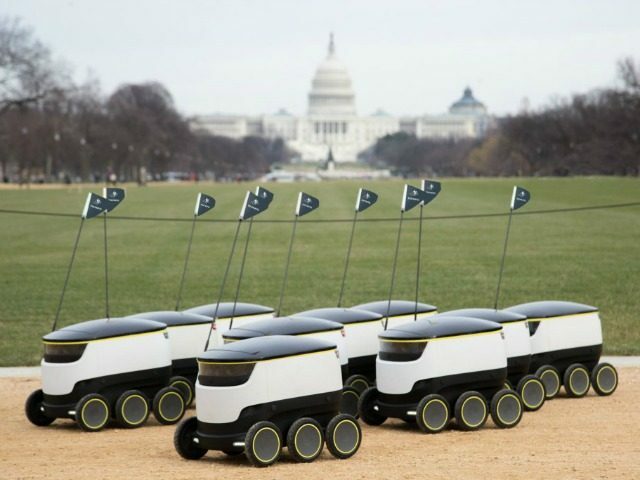 Postmates isn’t the first company to test the delivery of food via unmanned vehicle. In 2016 Dominos Pizza became the first pizza company to deliver an order via drone to customers in New Zealand. “We invested in this partnership, and technology, because we believe drone delivery will be an essential component of our pizza deliveries,” said Domino’s Group CEO and Managing Director Don Meij as the company announced a partnership with drone delivery service Flirtey. Mexican fast food chain Chipotle began working with Alphabet, the parent company behind Google, to deliver burritos via drone for students at Virginia Tech in 2016 also. “It’s the first time that we’re actually out there delivering stuff to people who want that stuff,” said the head of Alphabet’s Project Wing, Dave Vos.